Sarasota County invites the public to a meeting about Phillippi Creek Water Quality at 6 p.m. on August 31 at the Florida House Institute, located at 4454 Beneva Road in Sarasota. 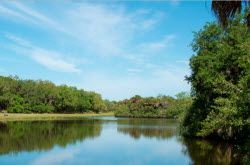 The Environmental Protection Agency has established Phillippi Creek as in need of a reduction in bacterial pollution. We are asking the public to share their knowledge of pollution sources at this collaborative, hands-on meeting. Participants will be guided through the process and will be asked to indicate possible bacteria (and nutrient) sources they know about on maps provided at the meeting. Later on, the problem locations will be investigated by a County-led interagency team. Walk the Watershed is a state of Florida process by which evidence and data is investigated in the field. The goal is to find the sources, and provide solutions for fixing the problems. In some cases there may be quick fixes, in others cases a longer term plan will be proposed, and in some cases public education may be the remedy. Clean Water comes from all of us doing our part. Arrive early (5:30 PM) for a tour of the Florida House led by FHI Executive Director John Lambie and see the green building, solar system, pervious pavement, cisterns, wildlife enclaves, Florida landscaping, and vegetable gardens that you can use at your own home. The meeting is FREE, but space is limited to the first 50 people who register here: Phillippi Creek Maps on the Table Meeting. If there is sufficient interest, additional public meetings may be scheduled. Remember this is a participatory process and we are listening to YOU. For more information, call Mollie Holland, Neighborhood Environmental Stewardship Team Coordinator at 941-861-5000.